In a surprise development, Congressional negotiators are said to be close to an agreement on a two-year budget deal. 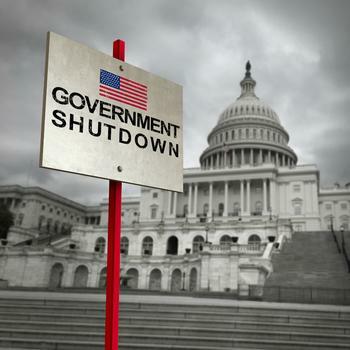 After an impasse over a three-week spending measure forced a brief government shutdown last month, there was widespread concern that another shutdown loomed on February 8 -- tomorrow -- when the temporary authorization expires. The Congressional blog Roll Call cites staff members from both parties as saying the two sides are closing in on a deal that would raise discretionary spending levels by nearly $300 billion over two years, while providing more money for the government's non-military programs. An agreement would prevent another government shutdown that would close national parks and furlough hundreds of thousands of government workers. A shutdown would also interrupt the Internal Revenue Services' (IRS) processing of tax returns, just as the tax season gets underway. If negotiators are successful in resolving all outstanding issues, Capitol Hill sources tell Roll Call that a vote could come this afternoon. Senate Minority Leader Charles Schumer (D-N.Y.) took to the Senate floor to fan the optimism, saying negotiators are making "significant progress." “The Republican leader and I have been working together quite productively,” he said. Any success would likely add a bit of calm to the financial markets, which have been marked by extreme turbulence over the last several trading days. If Republicans and Democrats can agree on spending caps, the two sides say the Senate would likely throw in a suspension of the debt ceiling -- another showdown Congress faces each year. Instead of shutting down the government, a failure to raise the debt ceiling could mean the U.S. government might default on its debt, sending interest rates skyrocketing. The crux of the deal taking shape in Washington appears to be increases in domestic programs championed by Democrats, including new funding for programs to counter opioid addiction and overdose deaths. However, the rising optimism is being countered by an unexpected complication. Any spending agreement must be signed by the President to become effective, and President Trump has said he would prefer to shut down the government if the legislation fails to address illegal immigration. Trump has said he supports granting legal status and a path to citizenship for the children of illegal immigrants, but he also wants changes to the legal immigration system and a border wall between the U.S. and Mexico in return. In a meeting with law enforcement officials and lawmakers, Trump said he would "love to see a shutdown" if Congress doesn't advance immigration reform.